Spencer and his motorcycle helmet. The first india ink drawing he every did. Wow. 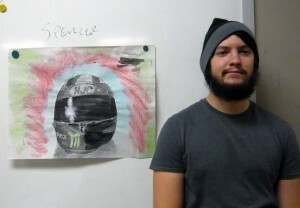 This student was recently in a serious bike crash and this drawing reflects his appreciation for this helmet. What a good day. Lots of student experiments and lots of good drawing outcomes. Today I experimented with ink. I learned how to use both dry & wet forms. My composition turned out great for my first time. I look forward to trying new things. We are in week 9 of the 11 week term. At the end of the term students are confident to explore new media. Most students come in to the course with experience drawing with pencils and ball point pens as well as elementary school memories of tempra and crayons. They are usually timid in drawing with strong contrasts and color. In my version of the observational drawing course students are exposed to our limited, but professional, collection of art supplies. The art supplies themselves become the teachers as I help students individually connect their personal direction with the possibility of the medium they choose for that drawing. Starting teaching the medium at the moment that it is voluntarily picked up by the student not only teaches the student directly but other students learn when students show their work in the daily exhibtis such as this one. We exhibit the drawings after each drawing session for a quick "art show." In the 2 art shows per class students put their drawings on the board with magnets and with their name. When one student has a good outcome using a new medium other students ask about the technique and become cofident to try it. The student who has success with the medium teaches what they learned to others. After a medium catches on with a few students I do a deeper demo of the potential of the medium. India ink is a good example. Students first see India ink as a comic book medium for creating lines. I demo pen nibs and brushes for types of lines, then how to use ink dillutions for wash drawings. Overall providing good art supplies and letting students discover new media for drawing themselves leads to motivated enthusiastic adoption of new tools for drawing. I make sure to let students know that there are parallel tools in digital graphics programs that they will be using professionally. And I encourage thelm to digitize their drawings to repurpose textures and elements when they start to take the upper level graphics classes in their programs.